Time to feature a couple of non-figurine penguins, don't you think? 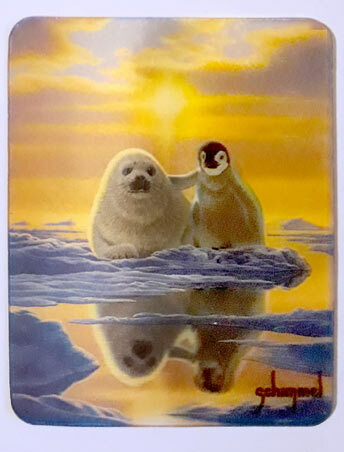 This is part of a group that has been waiting for their time in the spotlight for ages – penguin fridge magnets! We've featured these every now and then, starting from the beautiful plaster one in 2007. However, the collection has grown considerably since the last time we looked at them, determined to slowly conquer the entire fridge door. So, let's start with this adorable duo of a seal pup and a Emperor penguin chick. The magnet is by 3D LiveLife Magnets. As the company name suggests, this magnet is indeed a faux-3D image created via lenticular printing, thus the slight fuzziness. The art is by the amazing Arizona-based Schim Schimmel. Though he is likely best known for his work for Disney, I strongly recommend checking out his portfolio if you're into slightly fantastical nature art.